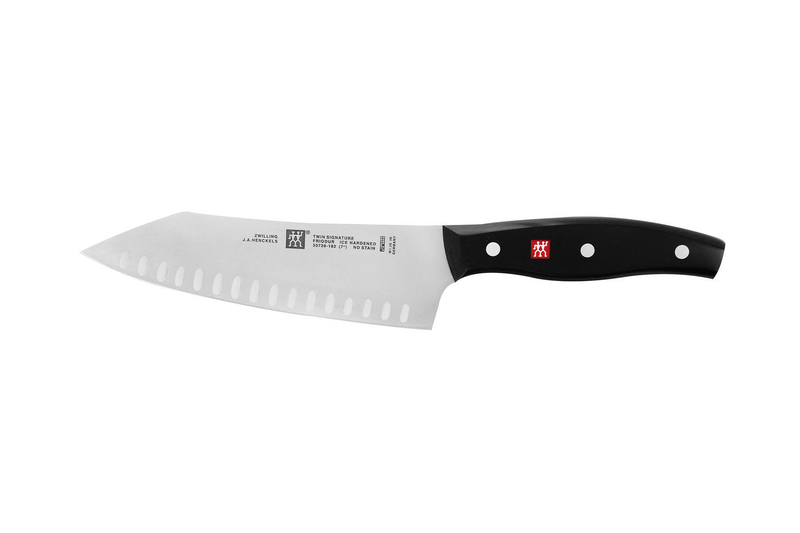 The Zwilling Twin Signature 7 inch HE Rocking Santoku is a great knife for chopping vegetables, slicing through meats and preparing fish. Supports Western circular motion and Asian chopping. The broad blade is useful for transferring cut ingredients to pot or bowl, and the indentations help keep food from sticking. This Santoku is a compliment to your standard knife collection. One piece full tang stamped construction. 15° blade angle with a laser controlled edge. Ice-hardened blades are remarkably sharp, stay sharper longer and highly corrosion resistant. Triple Riveted handle for strength. Dimension: 5½ inch blade, 12½ inches long. Lifetime Warranty, with proper use and care.